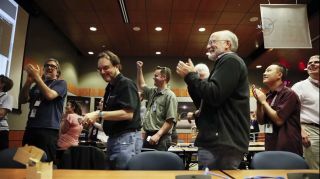 Members of the New Horizons team cheered after the probe began the sequence of science observations that will lead it through its close approach with Pluto. NASA's New Horizons probe has officially begun to execute its sequence of Pluto flyby observations as it zooms toward its closest approach to the dwarf planet on July 14. Mission representatives say New Horizons is "back on track" after it experienced an anomaly on July 4 that caused it to go into a temporary "safe mode." The anomaly was later shown to be the result of too many commands being executed at once. As the probe nears Pluto, NASA TV will air daily updates from mission control at the Johns Hopkins University Applied Physics Laboratory in Laurel, Maryland, at 11:30 a.m. ET (1530 GMT), through July 14. In an update Wednesday (July 8), Alice Bowman, mission operations manager for New Horizons, said the July 4 anomaly gave the mission team a bit of a scare. "We were all a little bit afraid of what might happen, but we put on our engineering hats and we went down our checklist and we did what needed to be done to recover that spacecraft to operational mode," Bowman said. New Horizons returned to nominal science operations on Tuesday (July 7). Mission team members reported that about 30 observations were lost during those three days. Those data represent "less than 1 percent of the total science that the New Horizons team hoped to collect between July 4 and July 16," NASA said in a statement. "We're delighted with the New Horizons response to the anomaly," Jim Green, NASA's director of planetary science, said in the statement. "Now we're eager to get back to the science and prepare for the payoff that's yet to come." Bowman said the spacecraft is currently taking science data as well as optical navigation data, which is "very important because it is a measure of how well we are doing on that trajectory to hit that specific point at the specific time that the science team wants us to hit. So that's pretty much what we're focused on now, is to get those science observations at the right time and at the perfect lighting conditions. "We're amazingly close," Bowman said. "It's hard to believe that we're here right now."